The sausage cutter allows you to prepare different kinds of sausage in a fast, easy and inexpensive manner. The feed chute and integrated blade can process sausages of a length of up to 210 mm. 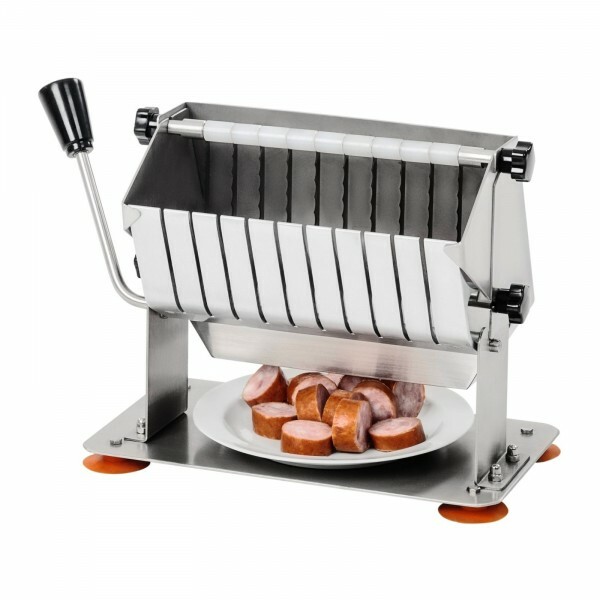 Ten sharp stainless steel blades allow you to cut the sausage into perfect bite-sized pieces. The sausage cutter is operated with a simple lever mechanism. By pulling the lever backwards, the feed chute and the sausage are pushed through the razor-sharp blades. Slices of exactly 18 mm fall down. There is enough space for placing a small plate or container to catch them. Versatile and flexible - the sausage cutter from Royal Catering! You can also cut soft fruit or vegetables into slices. The consistency of the food should resemble that of a cucumber. The softer the food item is, the easier the cutting will be. Rubber knobs ensure a sturdy footing and prevent the device from slipping. The sausage cutter is made from robust, non-corrosive stainless steel. The high-quality material is a guarantee for longevity and makes for an easy cleaning. The device is space-saving and measures only 185 x 335 x 225 mm which means it will fit into any kitchen. The hand sausage cutter can be disassembled into its component parts. The feed chute and the blade can be easily removed. A thorough cleaning of the component parts is very easy, and the blade is dishwasher-safe. Manual sausage cutter for currywurst, sausages, etc. They get sold in the thousands per day. One of the most popular German snacks - the currywurst! It is very important that the sausage is easily and quickly cut into evenly sized bits. Complement your snack bar with the sausage cutter RCSC-18 from Royal Catering. The perfect little helper for preparing the perfect currywurst or sliced sausage for stews or goulash. The device has been specially designed for the professional gastronomy and is mainly used in snack bars, bars or restaurants.